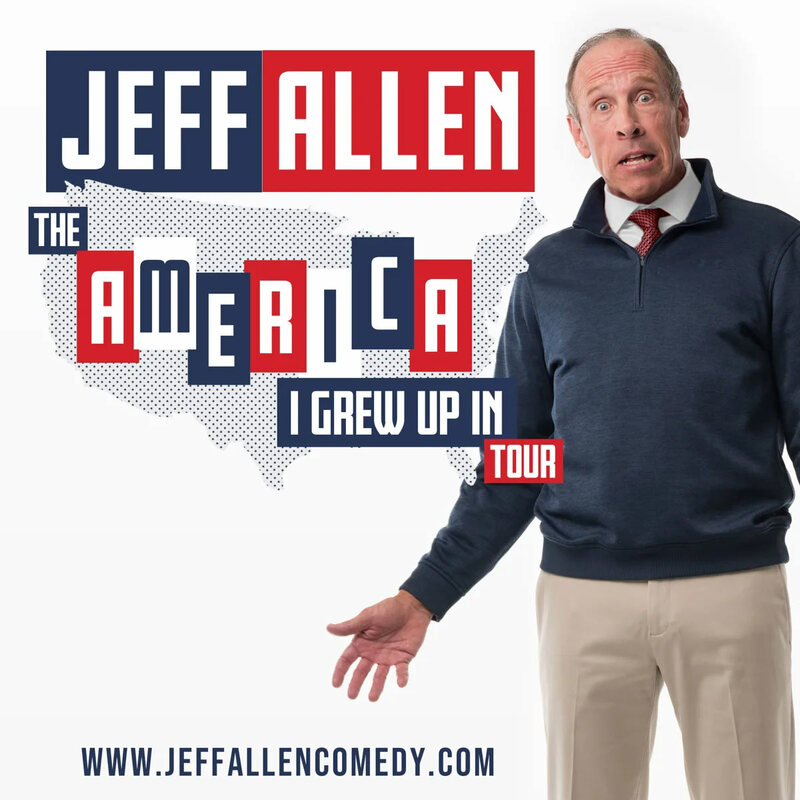 Monday, April 8, 2019 — Stand-up comedy favorite Jeff Allen is hitting the road with his all-new The America I Grew Up In Tour, putting him in front of comedy fans from coast-to-coast. The initial tour dates were released this week, extending into 2020 with additional dates to be added nationwide. The tour announcement comes on the heels of several viral videos released in February and March by Dry Bar Comedy. To date, the six videos have amassed nearly 40 Million views on Facebook and YouTube. Among the performances posted, three in particular have gone viral with millions of views and hundreds of thousands of shares. “The America I Grew Up In” (posted February 20) has over 18 million Facebook views, “Teenagers are God’s Revenge” (posted March 4) has over 10 million Facebook views, and “Wife’s Code” (posted February 23) is approaching 5 million Facebook views and climbing.Jeff’s rapid-fire humor, which centers on marriage and family, is a hit with all ages. Regarded as one of the premiere clean comedians working today, Jeff began his career in comedy clubs in 1978. Humiliated by the low pay and lack of respect, Jeff turned to drugs and alcohol, nearly destroying his marriage, family and career. He got sober In 1987, found God a decade later, and then did what all good comedians do…. found the humor in it all. A live comedy favorite, Jeff has headlined numerous tours and performed at the most prestigious venues in the world, including the Aspen Comedy Festival, Montreal’s Just for Laughs Comedy Festival, Grand Ole Opry, National Prayer Breakfast, Bill Gaither’s Homecoming tours, a Presidential Inauguration and more. In addition, Jeff has also performed for American troops around the world, including in Bahrain and on ships in the Persian Gulf and the Indian Ocean. Jeff also performed for the troops on the Ramstein Air Base in Germany, which is one of the largest air bases in the world and serves as the headquarters for the United States Air Force in Europe, Air Forces Africa (USAFE-AFAFRICA) and NATO Allied Air Command (AIRCOM). His extensive television appearances include Showtime, Comedy Central’s Premium Blend, VH1’s Standup Spotlight and more. He starred in the critically acclaimed film, Apostles of Comedy, the syndicated comedy series, Bananas, and his own Odyssey Channel/FamilyNet one-hour comedy special, Happy Wife, Happy Life, which was also the title of his PAX TV sitcom pilot. Jeff was also featured in the Warner Bros. comedy film, Thou Shalt Laugh. Additional dates to be added! Celebrate the 35th Anniversary of Ghostbusters on 4K June 11 with New Bonus Features!